Output Voltage Swing The output voltage swing consists of two distinct segments. First, there is the turn-on voltage VGHx between pins GHx and VEx. VGHx is regulated and maintained at a constant level for all output power values and frequencies. The second segment of the output voltage swing is the turn-off voltage VGLx. VGlx is measured between pins GLx and VEx. It is a negative voltage. It changes with the output power to accommodate the inevitable voltage drop across the internal DC/DC converter. The SCALE-2 dual driver core 2SC0650P combines highest power density with broad applicability. The driver is designed for both high-power and high-frequency applications requiring maximum reliability. It is suitable for IGBTs with reverse voltages up to 1700V and also features a dedicated MOSFET mode. The embedded paralleling capability allows easy inverter design covering higher power ratings. Multi-level topologies are also supported. CONCEPT'S patented planar-transformer technology assures efficient and high-voltage isolation with long-term reliability and sets new milestones in compactness, interference immunity and performance. Its outstanding EMC with a dv/dt strength of more than lOOV/ns allows safe and reliable operation in even the toughest industrial applications. Thanks to its ultra-flat design with an insertion height of only 7 mm and a footprint of 57 x 62 mm, the 2SC0650P can efficiently utilize even the most constrained insertion spaces. Compared with conventional drivers, the highly integrated SCALE-2 chipset allows about 85 % of components to be dispensed with. This advantage is impressively reflected in increased reliability at simultaneously minimized cost. Equipped with the latest SCALE-2 technology, the driver core opens up the possibility of working with clock frequencies of up to 150 kHz - at best-in-class efficiency. 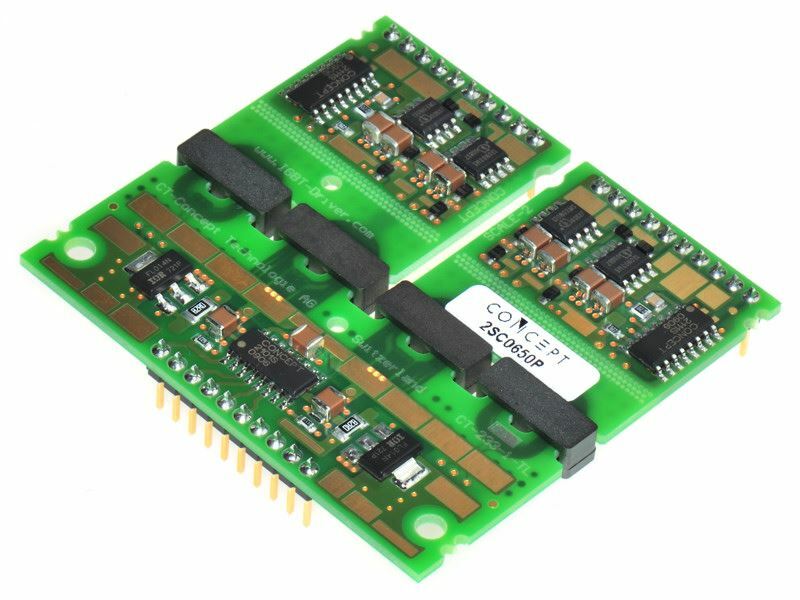 The 2SC0650P combines a complete two-channel driver core with all components required for driving, such as an isolated DC/DC converter, short-circuit protection, improved active clamping as well as supply voltage monitoring. Each of the two output channels is electrically isolated from the primary side and the other secondary channel.